Last week, I wrote about making some goals for my 41st year, which will start on St. Patrick’s day. My 40th birthday is coming up, and quickly – I can’t believe it. I’m not particularly happy about turning 40. When I turned 30, it was a big deal – I was pumped up about it and truly excited! I felt like I was a true grown-up, which is crazy considering I was still single, living on a great income for just me, volunteering my time when I wasn’t partying and living it up, and sleeping in on the weekends. I was hardly a bona fide grown-up. I was a fiscally responsible party girl with no perspective on marriage and kids and real problems beyond having lost my job at the age of 24 during the Enron/Arthur Andersen debacle. The last time I was down about my birthday, and getting older in general, was when I turned 25 and I hadn’t met any of the arbitrary goals I’d set for myself when I was naively 19 years old and a freshman in college. For some crazy reason, I had set my goals at being married, having a child or two, owning a house, and loving my job. When I turned 25 (my god, that sounds so young now, because it IS), I was chronically single, I obviously had no children, I was renting an apartment (but an AWESOME apartment on Wacker and Michigan Avenue in Chicago, so that was not getting me down! ), and I was not happy with my job. I learned on St. Patrick’s Day, 2001, as I cried to my best friend with tears falling into my horrendous draft American beer, that I would never, NEVER, make stupid arbitrary goals again for another birthday. So here I am, turning 40, and I have not set any insane, arbitrary goals for this birthday. I am the complete opposite of that 25 year-old girl from 2001 – I am very happily married (he was so worth the wait), I have two fabulous boys (so worth the agony and years of trying to have them), we own a home that we really love, and I mostly love my job (my job is staying home with my boys)! I don’t know what kinds of arbitrary goals I could have set for turning 40, but I don’t think they’d have included being a stay-at-home mom at the peak of her health and fitness, that’s for sure! Now that I am where I am, I think it’s time to set some goals for just the next year. We’ve really eased into a good place with the kids – they’re both in school 3-4 mornings a week, they will both attend summer day camp every-other-week in the mornings, my husband and I can travel without the kids, we go out on dates without the kids and without feeling guilty about it, and we can communicate with both of the boys very clearly which just makes life easier! In regards to “us,” we really like each other and are in love, and cannot imagine having someone else for our best friends. In regards to “me,” I’m the healthiest I’ve ever been and I can physically do anything I set my mind to with a bit of training and focus. Life is good, it’s stable, it’s happy. So I shouldn’t be dreading turning 40, but I am. I’m just being honest here. “I’m 40” sounds so old. I know it’s not really that old, but is just sounds so old. I need to do something to get excited about my 41st year. So, I’ve been thinking about my goals. I’ve been thinking long and hard about them. I’ve already set my fitness goals and calendar through July 23rd – every.single.day.is.planned. After that, the goals are high-level. But this goes beyond fitness, it goes WAY beyond fitness because there’s more to me than being fit and strong. Cake decorating course – buttercream, perhaps? Haunted forest – are the kids ready? And on day 2 of this week, I’m at 142.4 pounds. Why couldn’t that have happened when I weighed in yesterday? GAH! Prepped 4 salads for my husband and me on Thursday night for Friday and weekend lunches – it felt good to make those mid-week instead of just on Sunday! 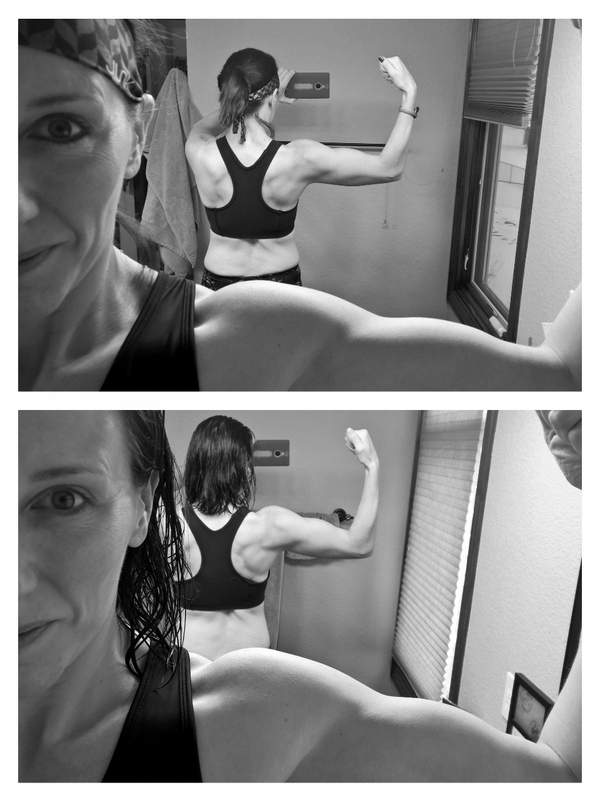 I’ve been pretty down lately with a sad shoulder that has stopped weight lifting and most intense workouts for a few days, but as I walked by the mirror two days into taking it easier, I caught a glimpse of this, and remembered that I didn’t build this body in 2 days, and I won’t lose it in two days. Perspective (and awesome lighting, for the win!)! Left is relaxed – normal. Right is flexed. I’ve hurt my shoulder… Badly. My shoulders are my weak point when it comes to strength. They’ve been causing me problems and trips to physical therapy since 2003. They are super sensitive to stress and both times I’ve done Max Hammer Strength, I’ve thrown out my right shoulder pretty badly. 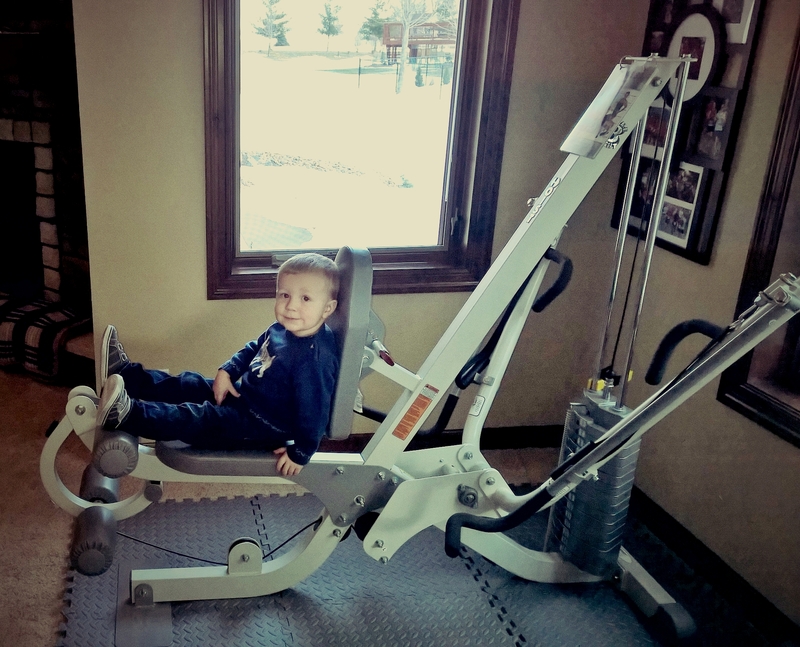 I may be done doing shoulder work with that workout, I think that might be prudent. I haven’t lifted a weight in two days. I almost skipped everything altogether yesterday but ended up doing ab work. Today, my husband reminded me that rest is good, stress is bad, and I agreed with him to take it easier. 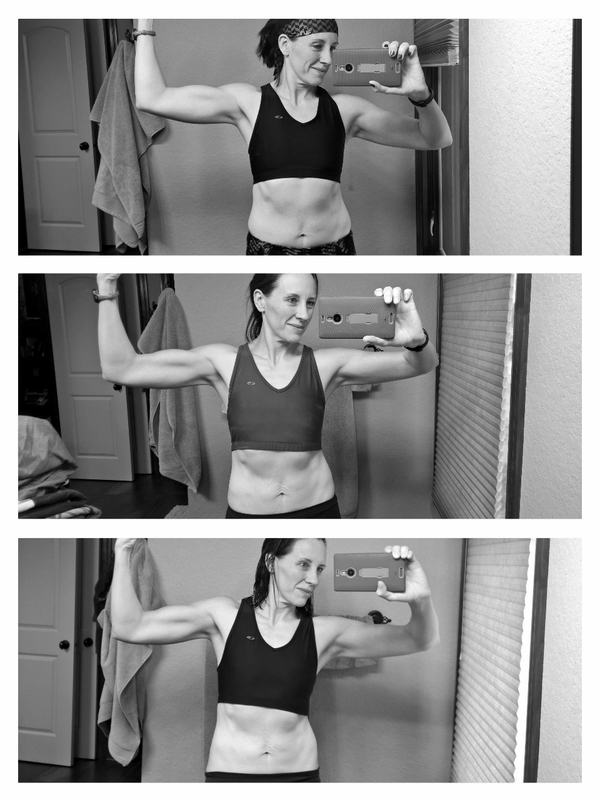 I did a 21 Day Fix Extreme workout that didn’t require weights (I felt like a pansy), a PiYo workout to stretch things out, and ab work. Not a big calorie burning day so I really watched it with food. As I was getting dressed in our closet, I caught a glimpse of my almost naked body in the mirror and, for the first time, saw what my husband has been telling me in regards to my abs. All of that nighty ab work is paying off, and skipping a few days of hard weight lifting to stay safe so I can start it up ASAP again is critical. I always feared that skipping a day or two would pudge me up, but my newly acquired perspective on the state of my health and body has given me the courage to rest when needed, which is a really nice change. I looked at myself and thought, “this didn’t happen in a day or two, and resting for a day or two won’t take it away.” I also thought to myself, “I never, ever thought I’d ever look like this.” Yes, I was feeling sorry for myself, but also feeling proud of how far I’ve come these last 19+ months. A good blog (and IRL) friend of mine had a birthday yesterday (happy birthday, Jos!) and laid out her fitness goals for the entire next year. She’s turning 35 in 2017 and wants to be her best self when that happens. I respect that – a lot. Being a goal-oriented gal myself, I loved reading her plan and, of course, got to thinking that maybe I should do something similar. I focus on 8-12 weeks at a time, but never lay out long-term goals and I think, as I turn 40 in March, maybe it’s high time I think further than 8-12 weeks into the future. I’ve been thinking about this a lot, and I started a spreadsheet (of course I did). I am going to break up my goals in 8-12 week chunks of time, for the most part, but have a pretty long stretch in the middle and a couple of short stretches just before and after that long stretch. In Jos’ birthday fitness post, another blog friend mentioned a goal of hers and I thought, “I’d do that with her if she wants a buddy to suffer along beside her.” A few text messages later and I think 4 of us are going to accomplish a big goal together this summer – and I’m super excited about that! I have almost 2 months to figure this all out, and I’m thinking on it a lot so I’ll have a plan mid-March. 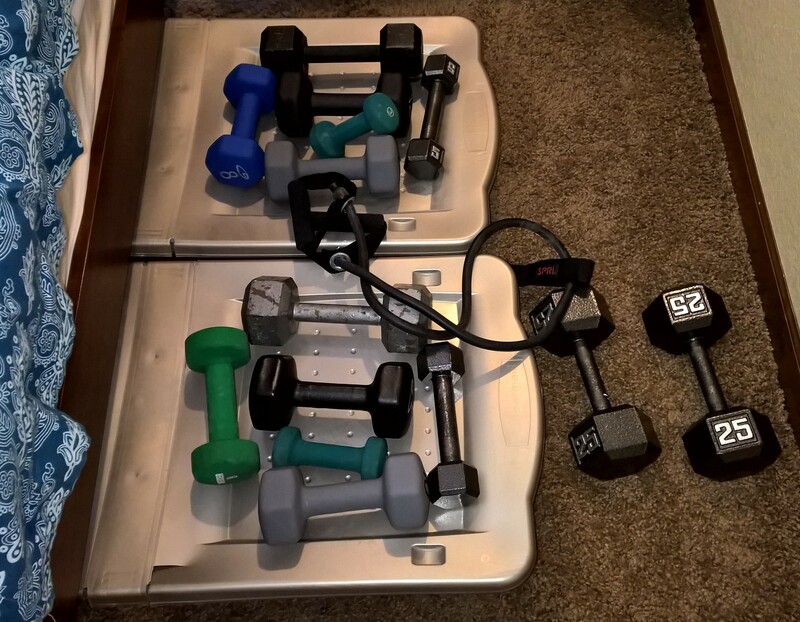 I’m really pumped up about this, ready to set some serious, attainable goals that will involve lots of different things – even beyond fitness. I want to be a well-rounded me in my 41st year and beyond. So… I’m taking notes… setting some stretch goals, refining expectations, thinking beyond my physical strength and abilities, and deciding who this well-rounded 40-something gal should be. We went on vacation for the weekend (Th-Sat) which was great timing because my shoulder was on fire from Hammer Max ISO Strength. That meant a lot of work had to be made up after 3 days of H&C resting, and I got it done by Sunday afternoon! Weight the day after vacation was 144.4 – not terrible given the lack of exercise for a few days! Not thrilled with the weight gain and body fat % gain, but I did take 3 days off, so what do I expect? Feeling looser after resting from H&C and doing a Fire 60 HIIT – those kicks felt so good at the end once my legs were loose! Prepped another week’s worth of salads on Sunday night and sent 2 with my friend to get her started on the right foot on Monday! We had the almond crusted chicken 3 times this week – the entire family loves it! 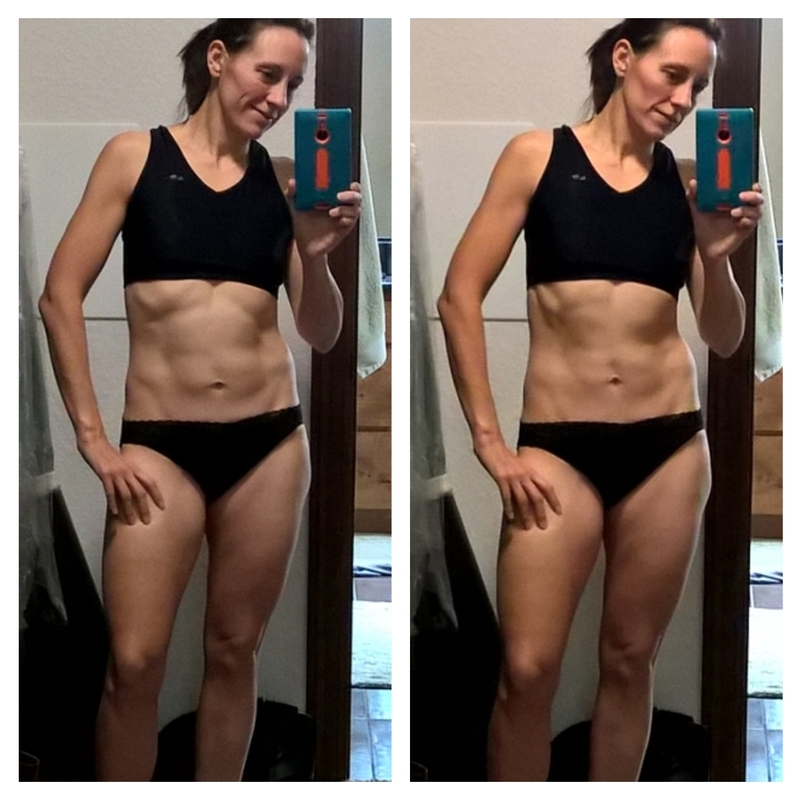 Body Fat is back in the 21%’s! 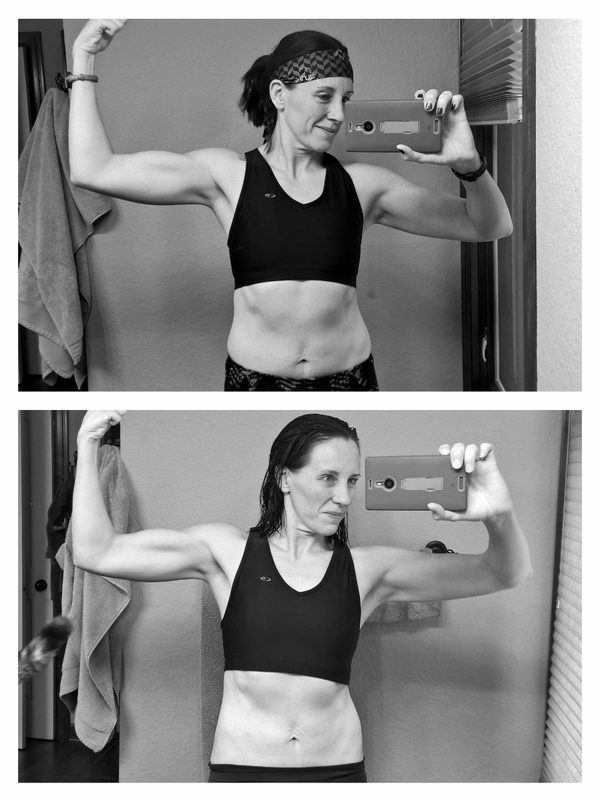 1 week and 2 days of H&C + running + clean nutrition = QUICK PROGRESS. 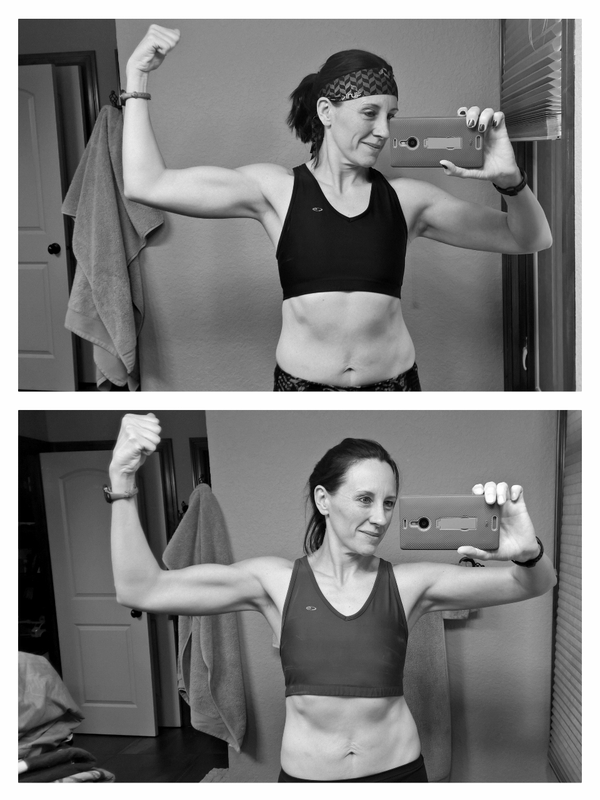 I am committed to taking progress photos every other week, but may just do them weekly based on this week’s change! There are moments when I look at myself in the mirror and don’t recognize the person staring back at me. The person looking back is strong, healthy, thin, confident. 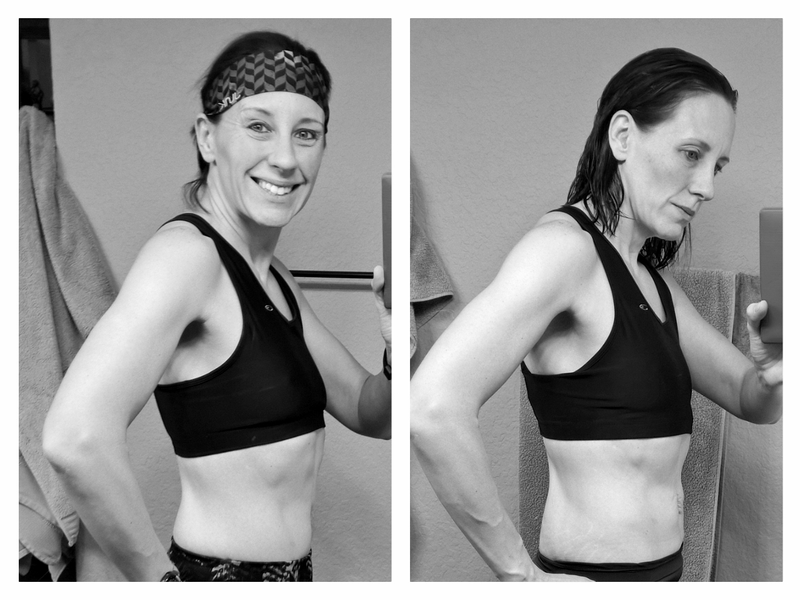 Even after 19 months at this daily effort at being fit and healthy, I sometimes forget that that is who I am now – Fit. Healthy. Strong. I’ve never been a “thin” person – not even as a child. I’ve written before, now almost an entire YEAR ago, how I still felt like the “fat girl.” I’m so glad that I don’t feel that way anymore. I truly do not. I’ve worked really, really hard to change how I view myself in the last year, and I think I’ve been successful. But on the flip side, I don’t feel like the “thin girl” either. When I went shopping with a friend over the weekend, the sales associate was selling some pants to my friend that I’d already chosen to buy for myself and she said, with a nod in my direction, “she has on the S/M, but she’s built like my daughter and is tiny.” TINY. No – that’s not me. I looked around to see who they were talking about, and yes, they were talking about me. Years and years ago (2006! ), when my friend came to visit me for my 30th birthday and I’d just wrapped up my first big weight loss (15 pounds at the time), she tossed her jeans in with my laundry and she wanted me to hang them to dry (this was before I started hanging all of my jeans to dry – thank you, Husband, for teaching me that!). I remember hanging them up and seeing the size – size 8 in Gap – and thinking, “man alive, those look small. I’ll never wear jeans that small.” I didn’t set any goals from it, it was a simple observation and thought – but a memorable one. Today, while picking up the closet, I hung up some jeans and – I’m serious here – I looked at them and thought they were my friend’s jeans. It was a total and complete flashback to my laundry room in my old townhouse. These jeans were small. They were, dare I say it?, tiny. And they are… mine. It’s weird to me, to be honest, that I’m wearing a 4/6 in all brands of jeans. It’s weird to me that my muscles show in photos when I’m not flexed. It’s weird to me that I sometimes need tops in a size small so I don’t drown in them. It’s just… weird. I’m happy about it, don’t get me wrong, but it’s surreal most of the time. I don’t see myself as the “fat girl” anymore, but I don’t see myself as the “thin girl” either. I just see myself as the “normal girl” now. Hammer and Chisel Challenge Accepted! I’ve laid out my goals and expectations for the Hammer and Chisel challenge I’m starting tomorrow here. I will check in weekly and post weekly stats as they occur. I’ve added the page to my main menu.